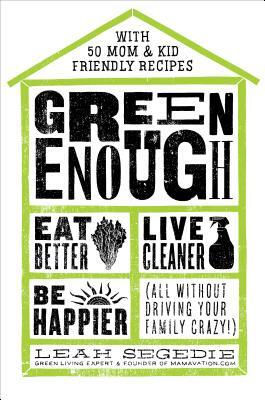 Eat Better, Live Cleaner, Be Happier--All Without Driving Your Family Crazy! A real, no-holds-barred take on making smart, healthy choices for you and your family. In Green Enough, Mamavation blogger Leah Segedie uncovers the truth behind the food and household products that are misleadingly labeled "all-natural" and healthy but are actually filled with chemicals and toxins. From furniture to packaged food, Leah guides you through detoxifying your home, diet, and lifestyle, showing you how to make the best choices possible. She exposes the brands and products that contain toxic and hormone-disrupting ingredients and gives guidelines on choosing safer products and organic produce that are free from toxic and persistent pesticides. She instructs you on making the move to meat, dairy, and eggs that are free of antibiotics, GMOs, growth hormones, and dangerous pathogens. She explains at what phases of childhood children are the most vulnerable and need more protection. And she includes delicious and kid-approved recipes to help you detoxify your cooking routine. It’s not about being perfect or 100% clean—none of us are—it’s about being green enough. Leah Segedie is the creator of Mamavation.com and CEO of eco-wellness conference ShiftCon. She has spent the last decade uncovering the deceptive marketing and fallacious propaganda embedded in our everyday lives from corporations and the food industry. Through her blog, thousands of moms have detoxified their lives and the lives of their children.